In 2013 massive opposition from the public, and hence from Congress, caused Obama to hesitate. War was avoided through a settlement, brokered by Russia, in which Syria would surrender its chemical weapons for destruction, the United Nations supervising. In June 2014 Secretary of State John Kerry exulted that the weapons were gone. Syria had denied using the weapons, and evidence pointed to rebels and Saudi Arabia as the culprits. (See “Who turned on the gas?”, 9/16/13, on this website.) Obama — who waged undeclared wars during all eight of his presidential years — later quietly invaded Syria anyway, without congressional approval and without the excuse of gas weapons. Let’s proceed to April 2017, when history repeated itself: On the 4th, poison gas was reported to have been used in Syria in Khan Shaykhun, a town in Idlib province, supposedly dropped from a Syrian warplane. The death toll was placed at 86. Two days later, President Trump sought to play God (a la Obama) and smite Assad for his sin — despite lack of evidence that the latter even possessed any more gas weapons, let alone used some. This time, the blitzkrieg was carried out. 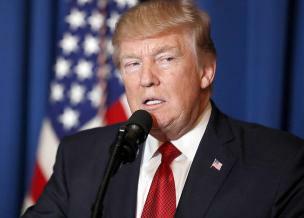 Trump sent 59 cruise missiles toward an airfield in Homs province in a sneak attack in the early a.m. hours of April 7. The Syrian news agency reported that the air raid killed nine civilians, including four children; one of the missiles fell in a nearby village, killing four of the civilians, including a child. Seven Syrian officers were killed too, said the Syrian Observatory for Human Rights, based in Britain. Congress had gone into recess the day before, April 6, so of course Trump acted without congressional authorization. Ron Paul, retired as a GOP congressman from Texas, saw “zero chance” that Assad used poison gas. In an Internet program and interview, he blamed the tale on neo-conservatives “terrified that peace was going to break out.” His son, Senator Rand Paul, Republican of Kentucky, tweeted his disapproval of bombing Syria when the U.S. “was not attacked” and Trump lacked congressional approval. On the Democratic side, Senator Tim Kaine of Virginia, unsuccessful candidate for vice-president on Hillary Clinton’s ticket, found the attack “unlawful” and “unconstitutional.” But, just hours before it took place, Hillary herself called for such aggression against Syria. Rep. Barbara Lee, representing Oakland and vicinity, called the Trump action an “act of war” and wanted Congress to reconvene and debate it. Rep. Tulsi Gabbard of Hawaii, an erstwhile military medic in Iraq, doubted that Assad did the deed he was blamed for. She said, “Trump has taken the advice of war hawks and escalated our illegal regime-change war.” She saw more dead civilians, refugees, and terrorists and the risk of nuclear war with Russia. What many don’t realize is that a continuing U.S. war plagues Syria — and Iraq and Yemen too. Obama first intervened, but Trump — who had called Obama’s foreign policy “reckless” — continues his predecessor’s wars. In fact, he has escalated them to a point where civilian lives are treated as expendable. Foreign lands seem to be merely battlegrounds; those living there don’t matter. Let’s not forget Afghanistan, in its 16th year of U.S. bombardment. On April 13, came news that the massive ordnance air blast (MOAB), the largest non-nuclear bomb in the U.S. arsenal, had been exploded in Afghanistan’s Nangarhar Province, adjoining Pakistan, supposedly against ISIS. With a mile-wide blast radius, it had never been used before; there was concern for civilian safety. No casualty count from the explosion was reported, but villages were likely within the radius of the blast. Marc Garlasco, who had been a senior targeting official in the Bush Jr. Pentagon, said he belonged then to a team that initially considered using it in Iraq but ultimately rejected it “due to collateral damage concerns,” i.e. that it would strike many civilians (from The Intercept). Besides violating the Constitution, all those war actions breach international laws. A small sample: the United Nations Charter. Article 2, requires members to “settle their international disputes by peaceful means” (Article 33 cites seven peaceful means) and to refrain “from the threat or use of force against the territorial integrity or political independence of any state….” The Hague Convention for war on land prohibits the attack or bombardment of undefended communities. Customary international law forbids indiscriminate attacks that strike civilians. Pundits have been puzzling over Trump’s 180-degree flip-flop: from advocating “don’t attack Syria” to attacking Syria; from “America First” to Middle East first; from anti-intervention and pro-peace rhetoric during campaign time to intervention and war-making as president. “Our goal is peace and prosperity, not war and destruction…. Unlike other candidates for the presidency, war and aggression will not be my first instinct. You cannot have a foreign policy without diplomacy. A super power understands that caution and restraint are really truly signs of strength…. We want to bring peace to the world…. America will continue and continue forever to play the role of peacemaker…. This century can be the most peaceful and prosperous the world has ever, ever known. That statement proves it doubtful that Trump ever learned the constitutional principle that deciding whether any battle is necessary is the function of Congress, not the president. It also shows that Trump is for peace, except when he is for war. And when there is war, there can be no peace until we have Victory (with a capital V). Of course, we have multiple wars going and no indication that any will end soon. War has been continuous since 2001. So where is that peace? Anyway, the attack on and near the Syrian airfield so soon after the chemical incident shows that “war and aggression” is indeed Trump’s “first instinct.” Was the attack “absolutely necessary”? The speaker added, “We will spend what we need to rebuild our military … We will develop, build, and purchase the best equipment known to mankind.” Yet, elsewhere in the same talk: “In this time of mounting debt, right now we have so much debt that nobody even knows how to address the problem.” Too little money, but plenty for war. Upon taking the oath to “preserve, protect, and defend the Constitution” on January 20, Trump lost little time in ignoring that document’s Article I, Section 8, Paragraph 11 and sending armed forces on undeclared, lethal expeditions in the manner of his many predecessors since Truman. Take Obama, who bombed and shot people — in Afghanistan, Iraq, Libya, Pakistan, Somalia, Syria, and Yemen — during all of his eight years as president, none of his belligerent actions having been authorized by Congress; Bush Jr., who started aggressive, undeclared wars against Afghanistan, Iraq, and Pakistan; and Clinton who ordered unauthorized attacks on Iraq, Yugoslavia, and six other countries. Nine days after taking office, Trump and his military launched a raid on Yemen that killed at least 14 civilians, nine of them children and the other five women. Human Rights Watch asked the U.S. administration to investigate (itself?). It said the high number of civilian casualties suggested that the military failed to obey the rules of war, not taking all necessary measures to prevent loss of civilian lives. It presented evidence that 25 villagers had succumbed in the raid. The U.S. military reported that 14 fighters of al-Qaeda Arabian Peninsula (AQAP) and a U.S. serviceman were killed. Three days after it took place, the military acknowledged that civilians, children among them, were probably killed. Yet the Trump administration pronounced the raid a success. U.S. Special Forces had been taken by aircraft to Ghyeel, a small village in the Yakla area of central Yemen, supposedly for “intelligence gathering.” Bear in mind that Congress had never authorized military actions of any kind in the nation of Yemen, on the Arabian peninsula. Village residents gave Human Rights Watch an account: At about 2 a.m., about 30 U.S. men with dogs approached the home of a Yemeni army commander. Men in the house heard intruders approaching and called out. Getting no response, they began shooting. Those outside returned the fire. Men inside the house fired warning shots into the air, whereupon those outside assaulted the house with gunfire. The gunfire soon escalated into a firefight between villagers and the invading Americans. Before long, helicopters and other aircraft attacked the village with light automatic cannons, damaging a score of houses. A member of the local governing council, Aziz al-Ameri, said he and his family saw helicopters surrounding the village. “They were shooting at anything moving … human or animal, even donkeys…. The women who have been killed, some of them were carrying their children, some running away.” One woman was related to him, Fatim al-Ameri, a mother in her mid thirties, who was found dead with her 2-year-old son in her arms; he survived. Another boy, 5, was found dead by the door of Aziz’s house. The director of a hospital five hours away said it received a nine-months-pregnant woman, shot in the stomach, and performed an emergency caesarean section; the baby did not survive. A small girl and a young man were both treated there for wounds. Residents of the Yakla area disputed U.S. claims that the victims were AQAP members. After the raid, photos of the children killed circulated in local media and on the Internet. One was Nawar al-Awlaki, 8, fatally shot in the neck. Her father, Anwar al-Awlaki, an imam, had been shot dead from a drone in 2011. Likewise her brother, Abdulrahman, 16, two weeks later. The shootings of both males came by order of Barack Obama. “This is worse than anything we have ever seen. Something is shifting, A lot more civilians are dying, and it’s happening on Donald Trump’s watch.” So said Chris Woods, a journalist who heads the British group Airwars, which monitors civilian war casualties. It currently concentrates on the U.S.-led bombing campaigns in Iraq, Syria, and Yemen. Airwars placed the number of civilian deaths from those campaigns in December, January, and February at 139, 264, and 110 respectively. But in March, 1,472 civilians were estimated to have succumbed to the bombings. That figure is 13 times the previous month’s toll and 17 times as great as the toll in the April 4 chemical tragedy. It takes in such offenses as the bombing of a crowded building in Mosul, Iraq, said to have killed at least 140 civilians. Various media have sought to explain the leap in civilian casualties. During the election campaign, Trump made it known that he would be more aggressive against “terrorists” than Obama. Trump said he would “bomb the s--- out of them,” referring particularly to the group calling itself the Islamic State of Iraq and Syria (ISIS). At one point, he even threatened to “take out” their families too. Military officers get the message. The new administration has undertaken many more air raids, and evidently lowered the threshold for deciding their sites and conditions: the “rules of engagement.” It is classified, but some observers, mostly foreign, cite a Trump order to change the “risk/reward” formula when determining how many civilian deaths are acceptable in planning an attack in a heavily populated area. The Washington Post reported that Trump had directed the military to accelerate the “militants’ defeat” and to determine whether to lift any regulations exceeding the requirements of international law. The White House, it said, had also been reexamining restrictions the Obama administration imposed last summer to avoid civilian deaths, which provoked complaints by some military leaders. The Post reported too that the new administration had given the military permission to intensify air operations against AQAP in Yemen without the customary, slower approval process overseen from the White House. Although the April 7 attack on the Syrian airfield and village drew media attention, undeclared U.S. warfare in Syria never ceased with the change in administrations and it continues. Woods, of Airwars, identified “two separate U.S. wars going on in Syria … the ‘coalition’ war” and “the separate shadow war against so-called al-Qaeda remnants….” By late March, the “coalition” had carried out nearly 7,800 air raids, 95 percent by the U.S. Obama had begun the bombings in 2014, following military support to rebels. In view of the many thousands of children, women, and civilian men who have fallen victim to such attacks since 2001 — and the use of terror weapons like MOAB — we can well ask Washington: Are we really combatting terrorism or committing it?